Hosty Review 2019: Is Hosty a Good Hosting? Small Lithuanian hosting company Hosty deals in web hosting, SSL certificates, domain registration, photoblog hosting, virtual private cloud, and Magento hosting. This company owns and operates a private infrastructure with Dell servers and RAID storage. Aside from registering domains and hosting websites in Cloud-based servers, Lithuanian hosting company Hosty also provides specialized hosting for businesses and photoblog owners. It also provides virtual private servers (VPS) and virtual private cloud (VPC) solutions. Every account holder enjoys lightning-fast backups. For years, Telia’s system engineers thought long and hard about how to prevent data loss, and they created a user-friendly automated system that lets customers recover lost data or restore backed-up website pages at any time. It’s also nice to know that they make manual backup copies of their customers’ web apps and websites, just in case. Unlike some hosting providers, Hosty leverages a cloud computing infrastructure that underpins all of their web hosting, VPS/VPC, and specialized hosting solutions. With their cloud-based services, you don’t have to worry about resource constraints or downtime. They use a distributed system that ensures your website will be accessible even if one or more servers fail. You also don’t need to worry about data protection or security since they provide DDoS protection services, and users can block suspicious IP addresses as well as securing their directories with passwords. Some of the big names in hosting have got nothing on Hosty’s prices, and the same goes for their features. Three hosting packages are on offer, with 3, 6, 12, and 24-month billing cycles. When you place an order, you can pay in cash (yes, really!) or by bank transfer. And if you don’t like what you see when you’ve signed up, you can cancel your hosting and get a refund within 14 days. Hosty comes across as a company that not only cares but also listens to customers. They don’t just solve your hosting problems by phone and then mark the case as closed; they also welcome suggestions and requests via email. Web and Linux administrators are available 24 hours a day to assist you with a myriad of hosting issues. Telephone support is the easiest way to get help, by calling them or requesting a call-back within five minutes. Email support is also available, and it typically takes no more than two hours to get a response. Hosty offers a good combination of fair pricing and timely support. They also value the customer relationship, which is why they welcome suggestions. This is a company that cares. 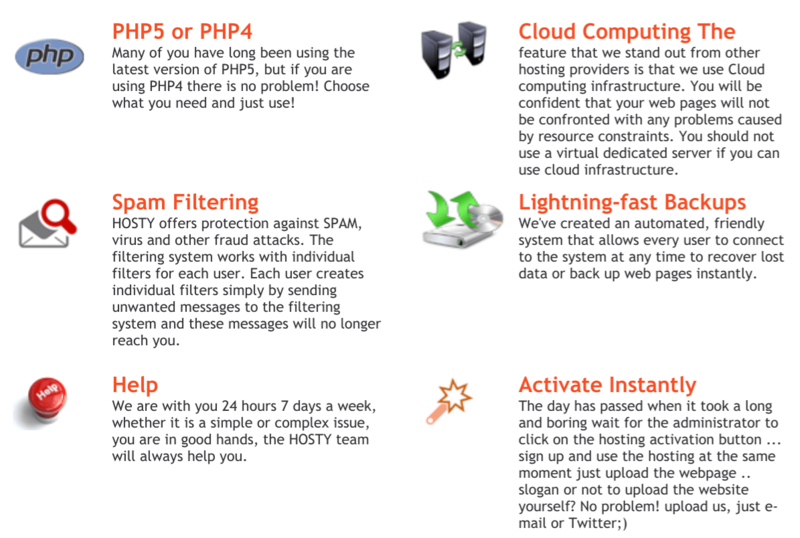 Get hosting from Hosty, a company that cares! Wondering how Hosty stacks up against other Web Hosting companies? Enter any other Web Hosting company and we will give you a side-by-side comparison.